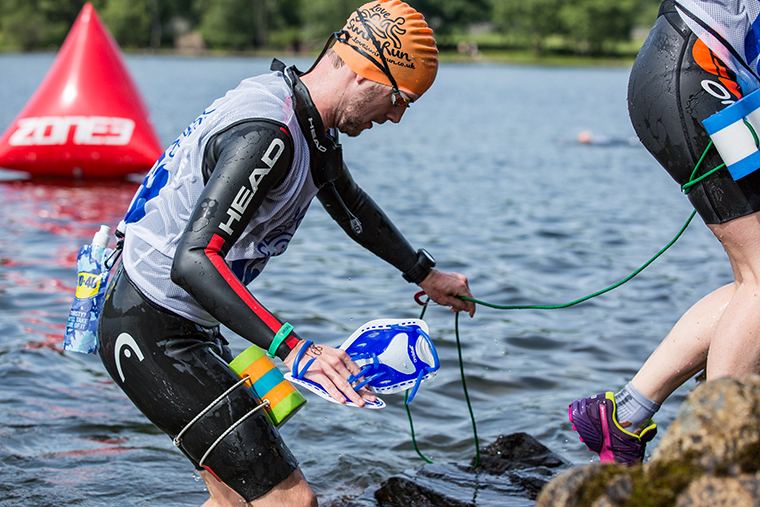 Chloe Rafferty shares her experience of using hand paddles for Swimrun. One of the most common questions I am asked regarding swimrun equipment is about the use of hand paddles and pull buoys. I’d like to share what I have learnt with you but one of the nicest things about swimrun is that there are no hard and fast rules about how you should swimrun. Hand paddles and pull buoys are not mandatory in any swimrun events (that I know of!) and they are not the right choice for everyone so I recommend that you experiment, as I have done, and find what works best for you! Why use hand paddles and a pull buoy? Swimrun requires a lot of strength and endurance. During the swimming legs you’ll be wearing a wetsuit, race bib, shoes, socks (yes, you wear socks!) and maybe a tow float or other accessories that you’ll have to drag through the water, often for long distances. Wearing hand paddles adds extra power to your stroke by increasing the surface area (‘catch’) of your hand, enabling you to pull harder and keep you moving forwards. A pull buoy (a buoyancy aid held between the thighs) gives extra buoyancy to your legs and elevates their position reducing drag as they trail behind you. It is still possible to kick whilst wearing a pull buoy but many swimrunners (myself included) do not kick at all whilst swimming and prefer to conserve their leg energy for the running sections of the course. Considering that even the most effective of swim kicks provide only a very small percentage of total power when swimming, this seems like a sensible thing to do! What are the benefits of using hand paddles and a pull buoy? The million dollar question is: do they make you swim faster? There is not an easy answer to this question. Lots of people who have had a play using hand paddles and pull buoy will tell you that they found no difference in their speed and some times that they even slowed them down! Some people just don’t get on with them and prefer to stick to ‘pure’ swimming. Indeed, this would have been me when I first started to use them about 4 years ago… However, I can now confidently tell you that after a lot of practice and perseverance that I am now averaging 2.30min faster over 1km with hand paddles than I can swim without them! This is 12.5% faster with paddles and that is not to be sniffed at! I have found that not kicking when swimming keeps my heart rate lower which saves energy and allows me to recover from strenuous running sections. Whilst this may not be true for everyone I certainly exit a swim feeling ready to run straight away. So, even if you don’t find that you can swim any faster using hand paddles, weight up the benefit of having rested legs and spare breath when you get to a transition! Should I try using hand paddles? If you want to be fast on the swim sections of a swimrun course then you will certainly want to at least try using hand paddles. If you follow all the advice below to make sure you do not injure yourself and persevere, gradually increasing intensity, then you are very likely to find some gains from using paddles. As well as increasing your swimming strength and fitness they will help you to hone your swimming technique. They have definitely taught me to use my back muscles when swimming and not just my arms! Some possible downsides to consider when using hand paddles are the faff factor of having them on your hands at transitions – when they are are on your hands how will you mange your goggles/pull buoy other kit and how will you carry them on the long runs? This is nothing that can’t be smoothed out with transition practice though and I just run with the paddles on my hands! If you suffer from (or have in the past) shoulder, back or arm injuries/weakness then you’ll need to take care when starting out using hand paddles because of the extra strain they will put on these joints and muscle groups. If you experience any pain using hand paddles, don’t ignore it! Stop and consult a physiotherapist or sports therapist for some advice and treatment. You may need to work on your swim technique to overcome these issues too – more about that below. How do I start using hand paddles? Strength is the key to using hand paddles. If you decide to use paddles in a race you must train with them a lot before hand. Never try using them for the first time on race day! Using paddles requires good technique and puts a lot of strain on your shoulders and back muscles. You need to build up the strength to be able to use them over long distances. If you don’t you will find you tire quickly and at worse will injure yourself. Doing some strength work on dry land will really help set you up for using hand paddles. Press ups, wide arm pull ups, lateral pull downs, shoulder raises and presses, tricep dips etc, are a great start to building some upper body strength. Strong forearms and wrists are also essential when the water gets choppy! Add in some resistance band work concentrating on swim specific, functional movements, especially if you have limited pool time. I found this swim specific band workout on Triathlete magazine website which you can do at home. If you can afford it, asking a professional coach or personal trainer to design a swim specific strength plan for you is a great option. If your swim stroke is not balanced or inefficient you may find you swim better without paddles than with them as they may accentuate the problems and actually slow you down. Worse still, with problems such as over reaching at the front of your stroke, not dropping your wrist before pulling back and dropping your elbow during the catch phase the extra pressure on the body caused by the hand paddles can lead to injury. If you are using hand paddles for the first time you may find that they slip off whilst you are swimming or that they catch in the water as your hand enters or exits the water, pulling it off your hand or if it is attached with straps, stopping your hand in the water and messing up your stroke. If this is happening you need to work on your swim technique. A good test for this is to use a hand paddle that has no straps at all such as the Finis Agility Paddle. I use these in the pool a lot. If you do not maintain a proper stroke, keeping a high elbow and even pressure on the paddle as you pull back, it will let you know by shifting or falling off. If you are having problem with your swim technique I highly recommend getting your stroke analysed by a professional coach and getting some lessons to correct your stroke. It will pay dividends for your regular swimming as well as for swimrun! Try getting in touch with Chris at Ucanswim based in Chester, or Adam at GreenlightPT based in Milton Keynes (Adam is an experienced swimrunner and can also provide you with a strength plan as suggested above). Winter is the best time to start building up strength for using hand paddles. Start incorporating hand paddles into your pool sessions now and build up gradually. Just as you wouldn’t go into a gym and expect to lift the heaviest weight, you need to start small and build up. It will take time but with each session you’ll be able to increase the load and duration so by the time the open water season comes around again you will be ready for longer training sessions in your wetsuit and trainers! After warming up, I started hand paddle training by swimming alternate 100m with and without paddles & pull buoy. I repeated that until I stared to feel tired and then continued to swim without gear until I’d finished my target distance – I believe that this training should very much be done by feel – stop using the hand paddles if you feel tired or feel any discomfort! At each session I would try to increase the distance I swam with the paddles, either upping each set to 150m with paddles or just trying to do two or three extra sets of the 100m’s. As I got stronger I could gradually build on these distances until I was swimming 1, 2, 3km with paddles! As your training progresses you could try incorporating some ‘drag’ into your training. This will go some way to simulate what it is like to swim with your race bib and trainers on. Start off by ditching the pull buoy so your legs drop lower in the water. Keep your feet together, and let them drag them behind you. You can also increase resistance with the use of ‘drag shorts’ which grab the water as you swim – a cheaper alternative is to swim with some baggy shorts on! Either way it makes swimming harder! Once you have built up the distance that you can swim comfortably with hand paddles you can start to train with them outdoors wearing the kit you’ll be racing in. Just as in the pool, build up the use of hand paddles in your open water training gradually. Your wetsuit will add strain on your shoulder muscles and your shoes will increase drag. Don’t expect to suddenly be able to swim effectively with paddles in an event with 6km of challenging swimming if you’ve only swum for 1km with them in the pool! Use them in open water in different weather conditions and make sure you get some sea swim training in if you are taking part in a coastal event. The unpredictable nature of weather, waves and currents adds another dimension that you cannot replicate in a pool. I really felt this when swimming 5km on a swimrun in Spain in very rough and windy weather. I was having to angle my arms to a much greater degree than normal to punch through the wind and waves effectively and my forearms were killing me! In open water you will also need to experiment with the size of the pull buoy you use. You may need a bigger one to counter the weight of your shoes or if you are in salt water which offers some natural buoyancy you may need a smaller one so you don’t bob about like a cork in rough water. See my article on swimrun kit to read more about pull buoys. To be successful swimrunning with hand paddles you need to persevere with your training. Keep working at it! It will take months to build up the strength to take on long swimrun events and even longer if you need to work on your swim technique as well. Keep a record every few weeks of the time it takes you to swim set distances with and without your swimrun kit so that you can see how you are progressing. It took me a long time to transition to using hand paddles properly and to gain speed but I have definitely found it worth the effort. Which hand paddles should I use for swimrun? There is a huge choice of hand paddles available, some are specifically designed for swimrun, but you need to try a few out to find the right ones, in the right size, for you. Remember, bigger does not mean better, especially when it come to hand paddles! Just like the training, start small and work your way upwards. Too much too soon will result in painful muscles and possibly injury and training setbacks. You must be able to maintain good technique, keep a decent stroke turnover and most importantly not overload your shoulders. If you have never used paddles before, half paddles such as the Speedo BioFUSE finger Paddle are a good starting point. I used these during my first ever swimrun in Loch Lomand, having only done a month of training with them and they were fine. If you’ve got some experience using hand paddles or you already have a strong upper body then by all means go for something a bit bigger or just use the paddles you already have. Paddles that have straps to hold them onto your hands are best for swimrun or they can easily come off and be lost in open water. I have seen people using strapless paddles, such as the Finis paddles mentioned above, but if you do try this in open water do make a leash to attach them to your wrist so they don’t get lost if they fall off! Swimrunners Hand Paddle The original swimrun kit! I have been using the Version1 in size M for pool training and racing. Zone3 Power Stroke Hand Paddle Get 25% off Zone3 gear when you sign up to one of our events! TYR Catalyst 2 These have a unique shape that is actually designed to reduce stress on shoulders. I have not tried them yet though! So, whether you should swim with hand paddles or not is a very personal choice based on your experience, your style of swimming, your strength, your body and the time you can dedicate to training. If you want to try them out make sure you follow the advice above to prevent any injuries and remember that you need to be patient to see any significant results. You need to build your strength up and improve your technique using hand paddles before you will see an increase in speed. If you just don’t like using them or for any reason you find they slow you down then just concentrate on swimming well without them! Although you’ll see the majority of swimrunners using them, there are plenty of swimrunners out that perform extremely well without using hand paddles or pull buoys, including some of the winners of our swimrun events! Whatever you decide, most importantly, enjoy your training and have fun!